FAQ: Which Chinese features are missing or broken in Windows 8 and 8.1? And how do I fix them? Q: Am I right in thinking that a Windows 8 Chinese feature I'm trying to use is missing or broken, or is it something I've done? Is there any fix? A: Windows 8 arrived missing many Chinese features we've come to expect, and the Windows 8.1 upgrade broke more of them. I'm keeping a list of these problems here, along with any fixes I've found so far. 1. Many Taiwan/HK/Macau IME options are missing. Bopomofo (New Phonetic) is missing options in tablet PC Settings. Quick offers no options at all on the desktop control panel, but does offer some on the tablet side. And unlike most other situations, if you make a change in the desktop control panel it may not change the same setting on the tablet side! Worst example: no Hanyu Pinyin in tablet mode. 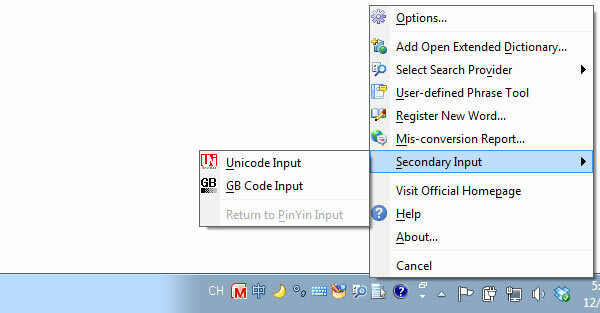 You can only change the "Bopomofo" IME to the Hanyu Pinyin keyboard on the desktop side. You still won't be able to use Pinyin in tablet apps. I have no fix for this. Most likely, we'll have to wait for Microsoft to release an update for this IME. Please let me know if you find a solution before I do. 2. The MS Word Phonetic Guide does not automatically generate Pinyin. This was working for me in Windows 8, but stopped working after the 8.1 upgrade. For most of you, Phonetic Guide will still automatically generate Zhuyin for Traditional characters, but when you try to get Pinyin for Simplified characters you will see only blank fields waiting for you to type in your own ruby text. Reinstalling the "MSPY 2012" package fixes this problem in Windows 8.0, and also fixed it in Windows 8.1 on most of my installations here after I first installed a system update. See my FAQ page on MS Word Phonetic Guide Missing Pinyin for download links and details. 3. The Cantonese Jyutping (粵拼) input method is missing; the Cangjie (倉頡) and Quick (速成) input methods' Options are mostly missing well into the life of Windows 8.1, but at least Quick itself returned somewhere between 8 and 8.1. Also, we only have only the versions of Cangjie and Quick that were called "New" in the 2010 IME update for Windows 7 and earlier, even though many users are very inconvenienced by having their work unexpectedly interrupted while they learn the new versions at the convenience of Microsoft. In addition, for Cangjie and Quick there is no way to control "associations" ( 聯想 / 詞組 ), and many other options are missing. The Jyutping phonetic input method, which was was improved and brought back to us in that 2010 update, has disappeared again in Windows 8. What kind of respect is this for the Traditional Chinese market? Hopefully these will appear in updates for Windows 8.x. Some features have appeared in automatic updates, but in the past big IME changes have been offered as a separate download we're just suppoed to find for oursleves. Please let me know if you find that update out in the wild before I do. I expect it will be called something like "Microsoft Office 輸入法 2014 IME Update", but it won't necessarily require you to own Office and it may have another name. I have a fix for this: Reinstalling the Windows 8 PRC/Singapore IME using the "MSPY 2012" package resets whatever connections the Taiwan/HK/Macau IMEs needs to use the MSPY resources. It does not seem to affect any of the 8.1 upgrade changes, but setting a Restore Point is a good idea. See my FAQ on fixing the Windows 8.1 "Bopomofo" keyboard's Simplified Chinese feature. 5. The IME Pad and everything else on the Tool Menu are missing from some keyboards in the Taiwan/HK/Macau IME. 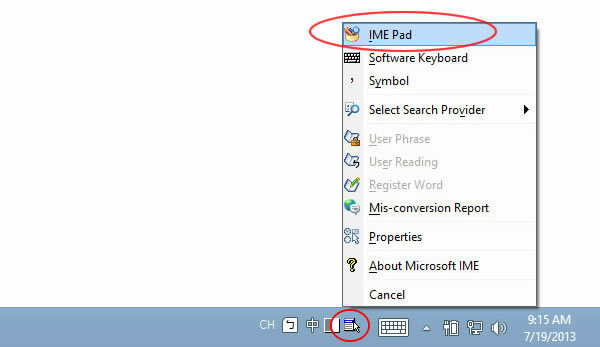 In my Windows 8 setup instructions, I explain how to find the IME Pad in Windows 8 by enabling the Desktop language bar. It is in the old-style Tool Menu. But the Tool Menu only appears when you are using the Microsoft Bopomofo keyboard. Switch to another keyboard, like Changjie, and it's gone. Hopefully this will be fixed, if and when the next IME update is released. 6. The PRC/Singapore IME is missing the IME Pad, Unicode and GB Code input, and everything else in the language bar and options menu. I can't make these things appear in my global US English Windows 8 release, even when in the Chinese locale. Below is a screen shot of MSPY 2010 for Windows 7 and earlier. As of MSPY 2012 in the Windows 8 global edition, the options menu is gone, along with most of the other features that were on the Desktop language bar for this IME. Hopefully we'll see this again, if and when an update to this IME is released. 7. The PRC/Singapore IME option controls are only in the 8.1 tablet interface. The image below shows where you should find "Options" links on the Desktop control panel. The Windows 8.1 upgrade broke them. This has been fixed in Windows 8.1 Update 1 (KB 2919355). If you have not yet received this update automatically, it is possible to install it manually. See Microsoft's instruction on how to install the latest Windows 8.1 update. I posted the following instructions for use before Update 1 was released. It seems useful to leave them available here. On a keyboard press <Windows>+<C>, or with a mouse/trackpad/etc., hover over the top or bottom right corner. If using a touch screen, swipe in from the left. Select the Settings gear icon. At the bottom of the screen, select Change PC settings. In the PC Settings screen, select Time and Language. Then select Region and Language. button. Click or tap on that button. the options that used to be in the Desktop control panel. Windows 8.1 still offers Traditional characters, but not the "Extended character set" of both Traditional and Simplified characters. Other options include full or double Pinyin, Fuzzy Pinyin, switching hotkey, dynamic ranking and self-learning, and a new one called "Cloud input method". To access other settings, click the arrow on the upper left. To exit these screens at any time, mouse users can hover over the upper right corner until a small image of your previous location appears, while tablet users can go there by swiping in from the left. In the last good version of MSPY - the 2010 update for Windows 7 and earlier - this Simplified-Traditional-Extended character set appeared, making it very easy to work in Traditional characters while using a mainland input method and mainland GB encoding. We can still go into the input method Options to change character sets, but that is not very convenient. And sometimes you really need to switch back-and-forth, because of a bad choice someone made with the characters available in Traditional mode. See #9. 9. The PRC/Singapore character set for Traditional Chinese is missing modern simplified characters in common use on Taiwan and elsewhere. Someone seems to think the only reason reason users of the mainland input methods would want to switch to Traditional Chinese is to work with very old documents and classical literature. Case in point: in the example above, you can only get the old version of "zhi3": 衹 instead of 只. In Windows 7, the modern simplified (small "s") character 只 was available. Many of us use this feature to ensure that our communications and documents are not corrupted when exchanging them with people in the mainland, as content often turns into garbage characters when you're using Taiwan Big5 or even the Unicode character set instead of GB Code in that situation. Other use it just because they like the MSPY input method better than MS New Phonetic / Bopomofo. Now in Windows 8, because we also can't conveniently switch between the character sets (see #8 above), this choice not to include modern characters like zhi3 is even more fustrating.